ITEM NO.49425. 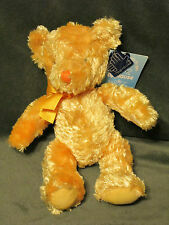 THIS IS A BEAUTIFUL GOLD COLORED TEDDY BEAR WITH A GOLD RIBBON MADE BY RUSS/APPLAUSE 9" TALL. Lot Of 2 Sock Monkey Bunny Ears Red White Stripe Plush Russ. Condition is Used. Shipped with USPS First Class Package.